I paid a visit to Miyamoto Unosuke Co., Ltd. in Asakusa. Established in 1861, they make many of the beautiful things used in Japanese festivals―decorative carts, portable shrine, drums, flutes, and much more. Come with me on a tour of the company that makes the Japanese festival possible. Miyamoto-san：Good morning, Thayne-san. I am Yoshihiko Miyamoto. Miyamoto-san：There are over 2,000 parts made of wood and also metal castings and fittings and cords, so it’s a lot heavier than it looks. It depends on how many people help to carry it, but each person needs to carry about 10 to 20 kilos. Miyamoto-san：When preparing for the consecration of the Great Buddha statue of Nara （752）, people started talking about inviting the powerful god of the Usa-hachimangu Temple. To attract such a god, they needed something worthy of it, and so they prepared a palanquin similar to that used to transport the Emperor. That is said to be the beginning of the mikoshi tradition. Miyamoto-san：The portable shrines can be divided into two types: those made with unvarnished wood, and those painted with lacquer. The unvarnished ones are made from a tree with a beautiful grain called the zelkova tree （keyaki）. Varnished ones use mainly hard wood from the Japanese cypress （hinoki）. We don’t use any nails in the main part of our mikoshi. They are held together by connecting interlocking joints that are carved into the wood, so we can pull the whole thing apart and replace any damaged parts. That makes it possible to use a mikoshi for 100 or even 200 years. Miyamoto-san：On each side is one of the four gardian: the Blue Dragon on the East, the Red Phoenix on the South, the White Tiger on the west, and the Black Tortoise on the north. You can also see all the animals of the zodiac carved around each side. The horse always needs to be at the front. I’ve never had an opportunity to look close at a mikoshi, but it looks so intricate. 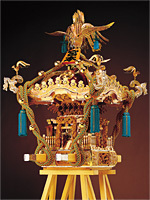 Miyamoto-san：The base is wood, upon which come gold-plated metal parts, carvings, and coats of lacquer. 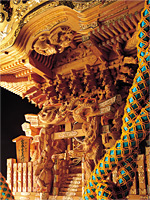 There are over 20 processes involved in making just one mikoshi. All these metal fittings are so interesting. It seems like a lot of arabesque patterns are used. Miyamoto-san：On each mikoshi, there are several hundred little metal fittings. If you go to Nara, you can see arabesque patterns among the treasures of the Shosoin Repository. The designs came to Japan from Persia centuries ago. They arrived on the Silk Road and were used in various areas of Japanese culture. You can also see these designs in the ancient court-music instruments （gagaku）. Miyamoto-san：People outside of the country think Japanese things have an image of being austere black or monochrome. But for festival things―mikoshi, drums, lanterns, and costumes―each item is cheerful, very colorful. But despite all the colors, it seems to somehow come together. This is also one side of the sense of color in Japan. So it’s not just simple color tones. I guess kabuki theater is also pretty colorful. Miyamoto-san：We also have ties with the kabuki world. Each kabuki play uses different types and sizes of drums, and also instruments to make the sounds of waves and wind. We also make those types of instruments and rent them out. Miyamoto-san：Traditional music is focused mainly around percussion instruments. Japan has so many different percussion instruments it’s sometimes called “drum heaven.” So people come here to look for the various sounds they need for things like festivals, traditional dancing, and stage performances. 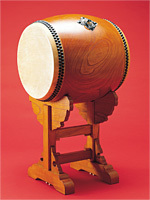 The word taiko（drum）covers a whole array of instruments. 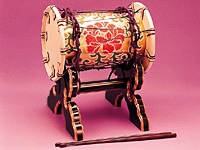 This is a nagado-daiko: used in regional festivals, cultural events, and accompaniment for traditional Japanese music. This drum has recently been used in performances by professional drummers, and in non-traditional music genres. On the fourth floor of the Nishi-asakusa store of Miyamoto Unosuke, you’ll find the Drum Museum where drums from around the world are on display. Pay a visit and you’ll soon fall in love with the drum. Miyamoto-san：That’s right. The zelkova（keyaki）with its beautiful grain is best for making drums. But now it’s hard to find large trees in Japan, so a lot of the drums today are made using bubinga trees from Cameroon. The trees are cut in portions and allowed to dry for several years in the shade, and then after maturing for three to five years, they are carefully hollowed out. Then leather is placed over the top and fastened down with tacks. It takes a craftsman skilled in “conversing” with the tree to create the low and soft sounds of a quality drum. It seems that you have a good job. Miyamoto-san：To be told thanks for something we’re thankful someone has bought is a good thing. What we do is closely related to celebrations, and so it’s really nice to be surrounded year around by people with something to celebrate. Festivals are where people come together―just plain people without regard for titles or age or anything else. It’s about creating communities. Children growing up in a place where all the adults watch out for them, and the elderly being made to feel important. During festivals, you really see who your neighbors are. I’ve even heard that places with active festivals are actually safer. It’s our job to make such festivals possible, and that’s a pretty good thing. I guess this is a good place to really learn about Japan. Miyamoto-san：I think so. Japanese mostly live in a westernized world, but culture is what holds up the ethnic values of a people. I don’t know what the future will be like, but I’m sure the important things will last. I hope that we can last and continue to be a guide for “Japan” in the future.